Long considered primarily in her role as a virtuous wife and model mother, Charlotte von Schiller has more recently emerged from the shadow of her famous husband and better known sister, the writer Caroline von Wolzogen, to be viewed as a gifted and creative individual in her own right. And while much current interest in the two sisters focuses on their early romantic triangle with the ardent poet and dramatist Friedrich Schiller (viz. the 2014 film Die geliebten Schwestern/Beloved Sisters by Dominik Graf), Charlotte Schiller has also begun to receive serious attention for her literary productivity, much of it still unpublished (e.g. Gaby Pailer, Charlotte Schiller: Leben und Schreiben im klassischen Weimar, 2009). In her knowledge of foreign languages, her avid reading and familiarity with European writers of her time and earlier, she also represents the many intellectually active women of the late 18th-century German nobility and upper bourgeoisie. Charlotte was the younger daughter of Carl Christoph von Lengefeld, the Oberforstmeister (Superintendant of Forests) at the court of Schwarzburg-Rudolstadt, and Luise von Wurmb, 28 years his junior. “Lotte,” as she was most often called, and her older sister Caroline (1763-1847) enjoyed reading and exploring the landscape around their leased estate in the sleepy royal residence seat of Rudolstadt near Weimar in Thuringia. Their father died in 1775, when Lotte was nine, and mother and daughters were soon in financial straits; Caroline agreed to rescue the family through her engagement at age 16 to the wealthy nobleman and Regierungsrat (administrative councillor) von Beulwitz, whom she dutifully married two years later, but never loved. Beulwitz and Caroline then shared a house in Rudolstadt with Mutter von Lengefeld and Charlotte. Frau von Lengefeld, or the “chère mère,” as her daughters called her, took a position as lady in waiting and governess at the Rudolstadt court; she hoped that Charlotte might assume a similar position at the nearby court of Sachsen-Weimar, where her godmother, Goethe’s long-time beloved and patroness Charlotte von Stein also served. To prepare her for this position Frau von Lengefeld and both daughters embarked on a year-long stay (1783-84) in Veyvey, Switzerland, on the northern shore of Lake Geneva, where Charlotte perfected her knowledge of French, a necessity for court life. 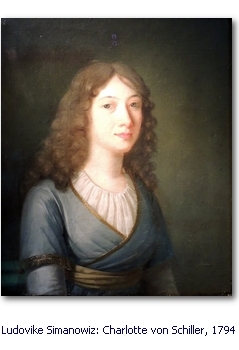 On their return journey the women briefly met Henriette von Wolzogen, a distant relation and the mother of Schiller’s school friend Wilhelm von Wolzogen; he would become a good friend and correspondent of Charlotte and would later marry Caroline, once she had finally divorced Beulwitz (1794). In Mannheim the von Lengefeld sisters also had a brief, superficial encounter with Schiller himself, which however left no lasting impression on any of the three. Both sisters kept a diary of their travel impressions; Caroline’s was published in letter form in Sophie von La Roche’s journal Pomona für Teutschlands Töchter (1784). The 18-year-old Charlotte also recopied her own diary once back home, but did not publish it, although according to Pailer it was equally worthy and a pioneering example of women’s travel literature, a genre which would flourish in the 19th century. The two sisters also both wrote poems, sometimes jointly. Charlotte gained exposure to more stimulating intellectual and cultural life beyond the borders of the relatively retrograde Rudolstadt in 1783/4 during visits to her godmother Charlotte von Stein in nearby Weimar. The duchy of Sachsen-Weimar, long governed by Anna Amalia, the highly cultured regent mother of young Duke Carl August, was to become the center of classical German letters, with intellectual luminaries Wieland, Goethe, Herder and eventually Schiller. During her stays in Weimar and at the von Stein residence near Rudolstadt in 1786-87, Charlotte developed a romantic relationship with a cultivated Scottish officer, Captain Henry Heron, with whom she discussed English literature such as works of Pope and Richardson. Although the two shared mutual affection and interests, their love had no future; like Charlotte, Heron, as the second son with no inheritance, could only marry into wealth. Failing that he had to make his way in the military or diplomatic corps, and was accordingly soon called away to be sent off to India. Charlotte, filled with disappointment and longing, retained a fascination with travel and foreign lands, and wrote her young friend Fritz von Stein that if she were of his gender she would not hesitate to travel the world if she could not find what she wanted at home (Pailer 49). In another letter she confided that she would want to study medicine and become a doctor if only she were a man. (Pailer 54). She found court life boring and much preferred spending her time reading, writing and translating. Charlotte’s and Caroline’s lives would take an unexpected turn with the arrival of the fiery young poet Friedrich Schiller in Rudolstadt, re-introduced to the two sisters by their cousin Wilhelm von Wolzogen in December 1787. Schiller, who had achieved fame with his Storm-and-Stress drama of rebellion and class criticism Die Räuber (The Robbers; 1781), had been introduced into Weimar society by his married mistress Charlotte von Kalb. At this time in his life, however, he was hoping to find a suitable bride – optimally one with money, since he had no secure income – and settle down. Schiller was immediately fascinated by the talented and creative Caroline and Charlotte and soon fell in love with both. The three spent several months together during the spring, summer and fall of 1788, sending a flurry of notes back and forth; clearly, the sisters were equally if not more attracted to him. A year later the already married Caroline suggested that he proprose to Charlotte; it is possible that both she and Schiller hoped to arrange some sort of ménage à trois. In a remarkable letter, he wrote “reassuring” Charlotte that while the older and more experienced Caroline was indeed closer to him in thought and feeling and stimulated his creative spirit more than she, he wanted Charlotte to stay just as she was, so that he, like Pygmalion, could form her himself: “Was Caroline vor Dir voraus hat, mußt Du von mir empfangen; Deine Seele muß sich in meiner Liebe entfalten, und m e i n Geschöpf mußt Du seyn….” Pailer 73) (“What Caroline has that you don’t you’ll just have to receive from me; your soul must develop itself in my love, and you must be my creature….”) In fact, Charlotte’s unquestioning devotion to Schiller’s happiness, her calm and even personality, and her practical strengths would make her a more suitable life-companion for the poet than the bolder, more passionate and demanding Caroline. Notwithstanding Schiller’s status as commoner and his meager earnings, the two were married on 22 February 1790. They resided at first in rented rooms in Jena, where Schiller now had an appointment as an “ausserordentlicher Professor für Philosophie und Geschichte” (unsalaried professor of philosophy and history) and the title of Hofrat (court concillor). Charlotte was able to prevent Schiller from providing a room for sister Caroline, who was all too eager to visit; instead she had to take rooms nearby when away from Rudolstadt and her husband Beulwitz. Charlotte could listen to her husband’s lectures from a room next to the lecture hall and asked him to bring her books from the university library. When Schiller had his first serious bout of illness in late 1790 and 1791 she took over his personal and business correspondence, including with his publisher. Thanks to efforts by the Danish author Friederike Brun the financially struggling Schiller was awarded a grant from the Danish government and the couple could move to a small house in 1793. In the same year they paid a visit to Schiller’s family in Württemberg, where Charlotte gave birth to her first child, Karl. The couple would have another son and two daughters, Ernst (1796), Caroline (1799) and Emilie (1804). Denn ich muß gestehen, daß Ihr, Humboldts, Göthe und meine Frau die einzigen Menschen sind, an die ich mich gern erinnre wenn ich dichte und die mich dafür belohnen können, denn das Publicum, so wie es ist, nimmt einem alle Freude. (zit. in Pailer 98). Ich muß mich doch wirklich drüber wundern, wie unsere Weiber jetzt, auf bloß dilettantischem Wege, eine gewiße Schreibgeschicklichkeit sich zu verschaffen wißen, die der Kunst nahe kommt” (zit. in Pailer 118). After some 14 years of ill health, Schiller died on 9 May 1805 at age 45; an autopsy showed that his internal organs – his liver, spleen, kidneys and heart – had deteriorated to such a degree it was deemed a miracle that he had lived as long as he had. 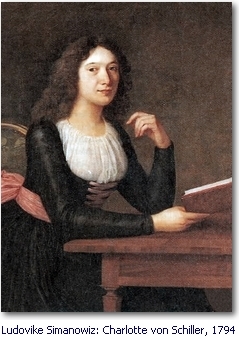 Charlotte’s life following her husband’s death revolved in large part around furthering her children’s education and careers and working to preserve and promote Schiller’s legacy as a great poet. 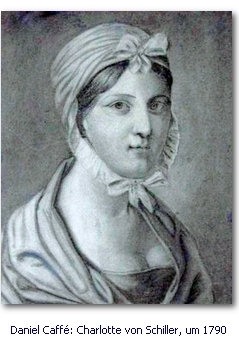 She survived the warlike conditions and military occupation of Weimar during the Napoleonic era (1806-15) while maintaining close ties with court society as well as such literary figures as Goethe and Knebel. Moreover, Charlotte kept up with new developments such as the emerging Romantic movement of Tieck, Novalis and the Schlegels, as well as women writers: Mme. de Staël, Therese Huber, Bettina von Arnim, Johanna Schopenhauer, Karoline Pichler. She remained a devoted admirer of Goethe as the standard bearer of the classical ideals her husband had championed; she was a harsh critic, however, of his relationship to his long-time mistress and eventual wife Christiane Vulpius, a woman of simple background. Charlotte (and others) called Christiane “die dicke Hälfte” (the fat other half; Pailer 156) and saw her as degrading the “Master’s” spiritual and intellectual qualities through her appeal to his “lower” physical side. Charlotte’s own writing in this period focused on dynastic marriage politics in which a noble princess plays a central role, and included “Die Königin von Navarra,” a novellistic adaptation of a French novel, and a sketch for a historical tragedy; she also wrote travel reports and poems. Remarkable throughout her life were her wide-ranging interests and efforts to adapt forms and themes from various national literatures in her poems, narratives and autobiographical writings. In 1825 Charlotte attended her son Karl’s wedding in Württemberg, then travelled on to visit Ernst in Cologne. In nearby Bonn she underwent an eye operation, which at first seemed to have been successful. But she developed headaches and weakness and died five days later, presumably of a stroke, on 9 July 1826. Aufenanger, Jörg. 2005. Schiller und die zwei Schwestern. München: Deutscher Taschenbuch Verlag. Baur, Eva Gesine. 2004. “Mein Geschöpf musst du sein”. Das Leben der Charlotte Schiller. Hamburg: Hoffmann und Campe. Jüngling, Kirsten und Brigitte Roßbeck. 2005. Schillers Doppelliebe. Die Lengefeld-Schwestern Caroline und Charlotte. Berlin: Propyläen. Kiene, Hansjoachim. 1996. Schillers Lotte. Porträt einer Frau in ihrer Welt. Frankfurt/M. : Fischer. Nauman, Ursula. 2004. Schiller, Lotte und Line. Eine klassische Dreiecksgeschichte. Frankfurt/M. und Leipzig: Insel. Pailer, Gaby. 2009. Charlotte Schiller. Leben und Schreiben im klassischen Weimar. Wissenschaftliche Buchgesellschaft: Darmstadt. Schiller, Charlotte und Caroline. 2014. Briefwechsel einer Dreiecksliebe: Band 1: Vom Rudolstädter Sommer bis zur Verlobung 1788-1789. Wilhelm Fielitz, Hsg. Aionas (CreateSpace Independent Publishing Platform). Schiller, Charlotte. 2013 . Charlotte Schiller und ihre Freunde: Auswahl aus ihrer Korrespondenz. Ludwig Geiger, Hsg. Bremen: Europäischer Literaturverlag, dearbooks. [Berlin: Hans Bondy].